Item is a photograph of a strange sundial in the front yard of Nelson Andrew's house located in Lennoxville. Item is a photograph of mounds of ice on the street, that came from a river in Bromptonville. A bulldozer is visible, pushing the ice blocks from the main street to open the road. Item is a photograph of a man in the streets of Bromptonville, standing next to mounds of ice, which came from the river. Item is a photograph of an aerial view of ice damage that occured in Bromptonville. A house is completely surrounded by ice and water from the St. Francis River. The item is a photograph showing Frontenac Street in June 1943 in Sherbrooke. The item is a photograph showing a truck and wagon full of people traveling through the flood waters on King Street and the Aylmer Bridge in June 1943 in Sherbrooke. 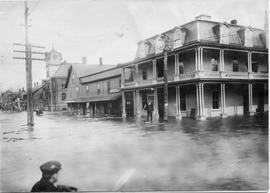 The item is a photograph showing a group of people in a boat on King Street during the flood, including a view of the Aylmer Bridge in June 1943 in Sherbrooke. 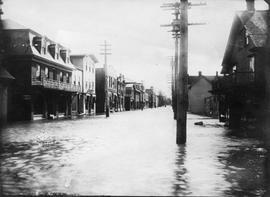 The item is a photograph showing the flood in June 1943 in Sherbrooke. The item is a photograph showing the Aylmer Bridge during the flood in June 1943 in Sherbrooke. The item is a postcard of Cape Gibraltar (also known as Point Gibraltar) on Lake Memphremagog, from around the 1910s. view of Magog River, Sherbrooke, P.Q. The item is a postcard with a view of the Magog River near Sherbrooke with canoes visible, from 1910. The item is a postcard with a view of Lake Memphremagog by moonlight, including a sailboat, from about the 1940s. La pièce est une photographie de la plantation d’arbres à Val-Estrie vers les années 1950. Toboggan slide at Sherbrooke, Que. The item is a view of the toboggan run in Victoria Park in Sherbrooke from around the 1920s. Victoria Park drive and bandstand, Sherbrooke, Que. The item is a postcard of the gazebo/bandstand in Victoria Park in Sherbrooke from 1909. Victoria Park entrance, Sherbrooke, P.Q. The item is a postcard of Victoria Park in Sherbrooke from around the 1910s.